Webster University Student Government Association (SGA) and Sustainability Office are hosting the first ever campus-wide Sustainability Week April 24-28. Sustainability Week will provide ample opportunities to educate oneself and to think critically about the most prevalent issues being faced by our natural world. The week will be comprised of a wide variety of events and opportunities for the campus community to make a greater connection with our campus’s built and natural habitats. Throughout the week, attendees at the events will be given a ticket (tickets can be picked up at any event during the week). Attendees are encouraged to get their ticket stamped for each event they attend to have a better chance of winning a raffle prize during the “Finish Strong” event on Friday. No registration is necessary and all activities are free and open to the public. Monday, April 24, 10 a.m.-12 p.m.: Natural Area Clean Up & Restoration Project - Volunteers will be pulling weeds and invasive plants, picking up trash and learning about the distinctive habitats in the Natural Area (located directly behind Garden Park Plaza). Be sure to dress appropriately for work outside. Webster University Grounds Crew and Biological Sciences are partnering for this event. 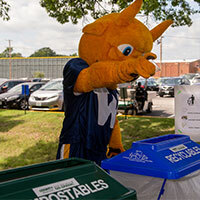 Tuesday, April 25, 1 p.m.-4 p.m.: Campus Waste Audit with Missouri Botanical Gardens - Waste will be collected from dumpsters around campus to then be sorted and weighed in an effort to better understand what kind of items we throw away on campus and how much our trash could be recycled. Supplies will be provided; any one is welcome to come help or observe. It will be held on the Quad near the University Center. Missouri Botanical Garden and Earthways Center are partnering for this event. Wednesday, April 26, Noon-1 p.m.: Quad Lectures: Environmental Justice (& Green Fair) - On the Quad (near the Gorlok statue), different campus organizations and local environmental groups will be onsite sharing resources, volunteer opportunities and offering giveaways. The Great River Environmental Law Center is partner of this event. Also, from 1 p.m.-3 p.m. at the Quad, Bruce Morrison from the Great Rivers Environmental Law Center and Dr. Amanda Rosen, assistant professor of Politics and International Relations at Webster University, will speak on issues of local and national environmental, political and social justice issues. There will be a few chairs, but most seating will be on the ground. Note: The rain location for Wednesday’s Green Fair from 12-1 p.m. and Environmental Justice lectures from 1-3 p.m. will be EAB Room 102. Thursday, April 27, 11 a.m. and 2 p.m.: Campus Green Tours - Come to the University Center and learn more about your home campus with campus tours led by the university’s sustainability planner Kelsey Wingo. The conclusion of the tour will include a special presentation by SGA senator Andrew Young on the environmentally-conscious elements that will be found in the campus' newest building: the Browning Hall Interdisciplinary Science Building. Thursday, April 27, 11 a.m.-12 p.m.: Campus Activities: Pots, Books & Planting - Come to the Sunnen Lounge, University Center and participate in hands-on crafts and a planting activity sponsored by Campus Activities. Friday, April 28, 10 a.m.-12 p.m.: "Finish Strong" Closing Event - SGA and the Sustainability Office will close the week with a “Finish Strong” event at the outdoor classroom outside of the Sverdrup Building in the Natural Area (located directly behind Garden Park Plaza). Come by to visit the make-your-own granola bar, receive giveaways and play some games with the SGA and Webster University Sustainability Office. Also, turn in your attendance tickets to be entered for raffle prizes from the university bookstore. We will also be joined by the campus Yoga Club for free lessons. Be sure to bring your attendance tickets. Click here for more information, and for questions contact Kelsey Wingo.